I’m tucked in behind the bubble of an authentic Isle of Man TT racer watching numbers roll past 140 mph on the speedometer, but there’s not even a whisper from the engine. 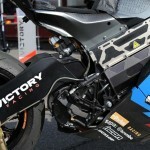 That’s because this Victory doesn’t have an engine – it uses an electric motor. 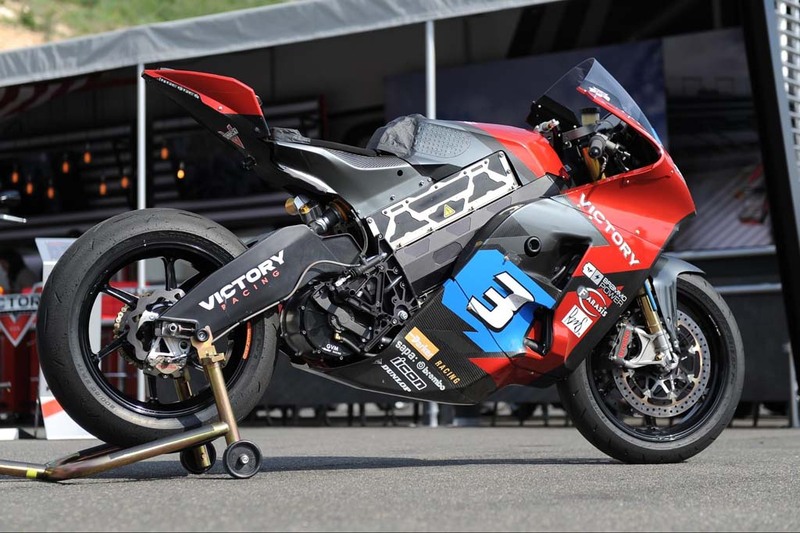 Yep, this is the same bike TT ace Lee Johnston rode to a podium finish in the 2015 IoM TT Zero race, lapping the legendary public-road course at an average speed of 111.62 mph. The bike is based on a Brammo that raced the TT Zero in 2014, but it’s been further developed since Victory purchased Brammo’s motorcycle business in January 2015. 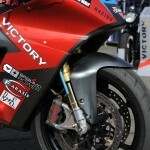 More info about the changes Victory made to the bike can be found here in Troy Siahaan’s article. Hey, Victory, throw some lights and mirrors on this thing! Victory had brought its racebike to High Plains Raceway in Colorado as part of the launch of its new Empulse TT, a streetbike based on the former Brammo Empulse R. The Empulse TT was a fun machine to play with on a racecourse, but its 54 hp is dwarfed by the 120 horses said to be on tap in the racebike’s state of tune that day. Lee Johnston was at the Colorado event, and he proved to be a likeable and gregarious racer guaranteed to raise a smile or be cracking one. 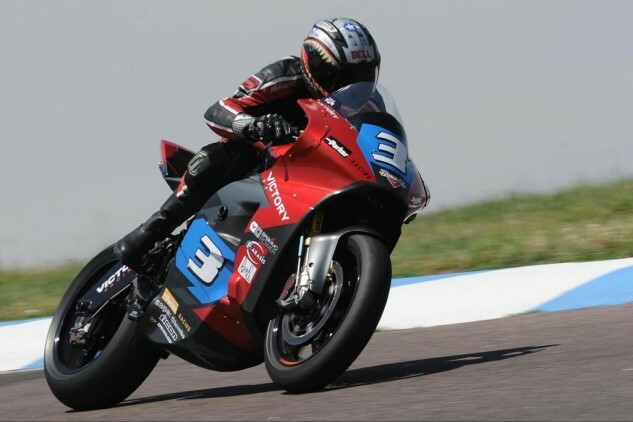 He said he hadn’t ever ridden an electric-powered motorcycle before the TT races, so he was unsure what to expect. Amazingly, the bike worked well for him right off the truck. All it needed to suit him were some mods to the Ohlins fork: stiffer fork springs, some shim-stack revisions and additional fork oil. No changes were made to the shock. The Parker GVM Internal Permanent Magnet motor is mounted below the swingarm pivot, which helps reduce squat under acceleration. The liquid-cooled unit – just 8 inches in diameter and 5 inches long – has the ability to churn out a purported 150 hp and 162 lb-ft of torque. Output was turned down to about 110 hp at the Isle of Man so that it wouldn’t deplete the batteries before the 37.7-mile lap was completed. The lithium-ion battery cells combine for a capacity of 16.5kWh. Swinging a leg over the Victory was a little unusual. It feels significantly taller than the Empulse TT – an extra 6.5kWh of batteries need to be jammed in somewhere. Also, at a stated 485 lbs, it’s on the heavy side for a full-on racebike without any street equipment. Unlike the Empulse TT, Victory’s racebike doesn’t use a multi-speed transmission – it has just one ratio. Gearing can, of course, be varied via the final drive. A 42-tooth rear sprocket was used when the bike was raced at Laguna Seca as a Brammo; Victory fitted taller gearing, a 39T, at the IoM because of its longer straights. Without a clutch or gears, taking off and accelerating was as easy as a scooter. And I mean that in a good way. Throttle, er, motor response was intuitive and pleasingly smooth. Dialing in power is as simple as twisting the grip, and it pulls with a relentless lunge that never seems to let up. The only trepidation felt was when adding power while leaned over. 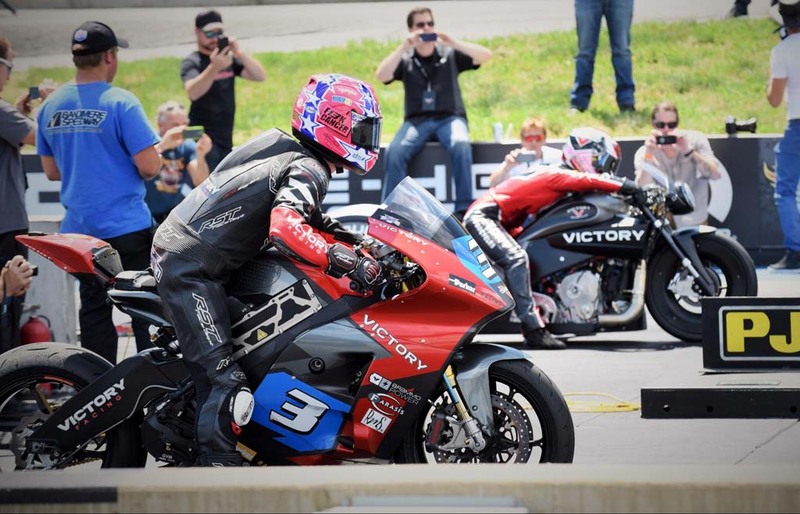 An electric motor simply doesn’t have the amount of flywheel mass as an internal-combustion engine, so I worried a sudden loss of grip when applying power might result in an ugly highside – Victory’s machine is raced without a traction-control system. Nevertheless, enough power was able to be laid down on the track’s 2,800-foot straightaway to see 142 mph on the speedo, the Empulse TT could only muster 113 mph. 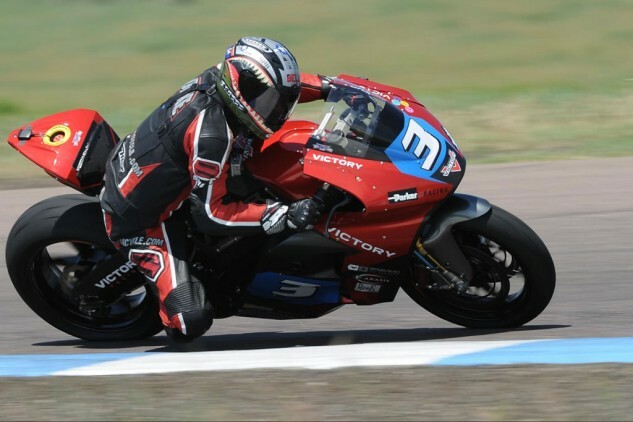 The most impressive aspect of Victory’s racebike is the confidence it inspires while leaned over. It uses a significantly longer wheelbase than the Empulse TT, and its mid-corner handling characteristics felt similar to a pre-1198 Ducati – very sure-footed. The High Plains circuit features 2.55 miles of asphalt playfully arranged with more than 300 feet of elevation changes, and the Victory voraciously lapped it up. Turn-in response is much quicker than expected from a sportbike scaling in at almost 500 lbs – credit lightweight forged magnesium wheels from OZ Racing shod with pointy and grippy Dunlop Pro tires. Also deserving praise is the suspension and brake package. The Brembo radial-mount monoblocks offer terrific feel, and the inverted Ohlins fork provides excellent support during braking. I could see why Johnston was so happy with the bike’s setup at the TT. Though I only got three laps aboard Victory’s racebike, I learned enough to know the platform is very raceable in its current setup, especially on short circuits where its power can be dialed up near maximum. With as much as 150 horsepower being available from the motor, the Victory isn’t short on speed. The Victory’s limitation for racing the Isle of Man is its battery capacity. Currently – pun intended – the 16.5 kilowatt-hours isn’t enough to race flat out the entire distance of the TT’s Mountain Course, so the motor’s maximum output can’t be exploited. The bike registered 144 mph on the TT’s Sulby Straight. A few years earlier, the Brammo predecessor was clocked at 170 while racing at Daytona. 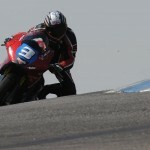 Isle of Man TT competitor Lee Johnston rode his racebike at Bandimere Speedway’s dragstrip the day following my ride while taking part in the American Victory Rally. With the motor’s power turned up for the short bursts down the quarter-mile strip, Johnston knocked off a best run of 10.6 seconds at 142.3 mph. To put that into context, consider that a Kawasaki Z1000 can do the feat in about 10.5 seconds, launching harder with its clutch and gearbox, but goes through the speed trap a good 10 mph slower. Gray, as is typical for an OEM rep, was quite cagey with his responses about what the future might offer. 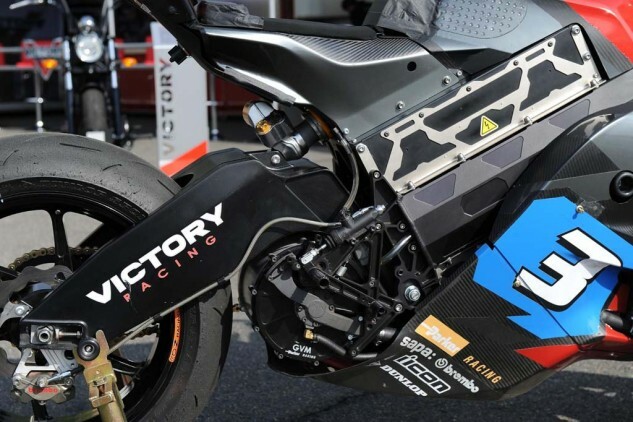 Will Victory build a new racer with more batteries for the Isle of Man TT, or will they refine and upgrade the existing bike for racing shorter circuits? 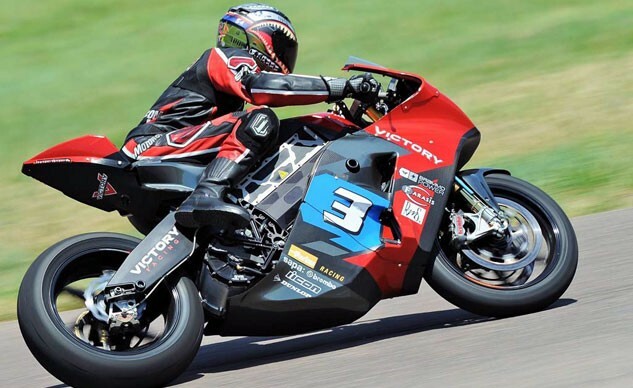 Hard to say what Gray is hinting at, but if I were forced to guess, perhaps we’ll see Victory’s e-bike racing up Pikes Peak next year along with its sister, Victory’s Project 156 that showed much promise in this year’s Hillclimb. Johnston told me he’d be up for the challenge if Victory decided to do it.